There was a time when not knowing all the knots was a heinous crime. But now, today, all new yachtsmen want to do an Atlantic circuit when they have never even sailed... Ask the boatyards and their brokers, you are not the only ones - and besides, why not dare to venture off at a time when deck hardware, ergonomics and equipment have made sailing so easy? 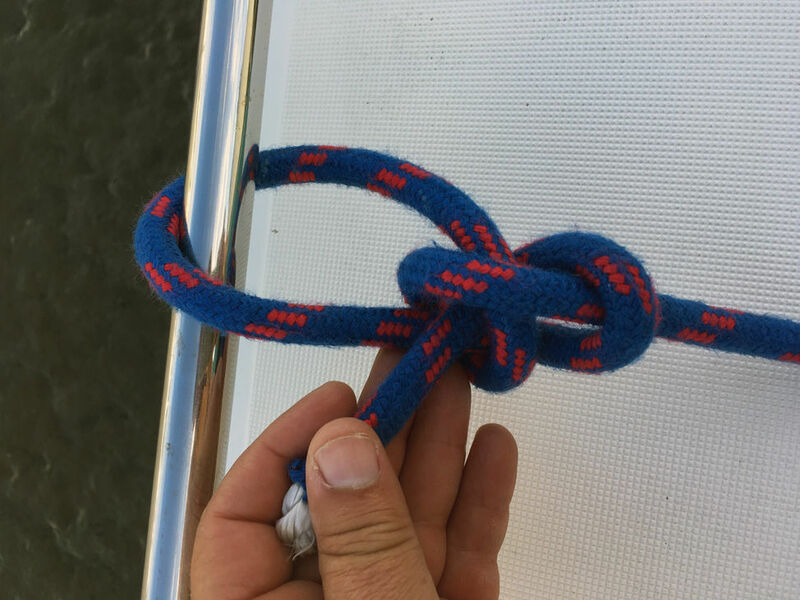 Admittedly, seamanship cannot be improvised, so a professional skipper and / or sailing schools will be there to help you acquire the basics... Whilst waiting for sunny days, here is the opportunity to learn, once and for all, three basic knots required aboard a multihull. You must know how to do these by heart. For the rest, you have plenty of time - or at least until the next issue of your favorite magazine! Sure, on board a performance multihull like this Outremer 5X, a lot of exotic ropes and professional ropework ... but for the sheets, the bowline is in charge! One end of the rope is all you need to learn, on deck or at home! This is a star among knots. Even when not very tight, it remains secure. The bowline can withstand the strongest tension and then still be undone easily - hence its multiple uses: sheets, halyards, mooring, extending lines (one bowline joined to another bowline). The hardest part is to make the “hole” in the right direction. The mnemonic trick: the rabbit comes out of the hole, goes around the tree (be careful, the roots grow underneath) and then back down the hole again. Behind this rather complicated-sounding name lies an ultra-simple and, above all, instinctive knot - no risk of getting it wrong after a first try. The round turn is very useful for stopping a heavy load - when coming alongside for example. You make the two half-hitches next, once the tension is lower. 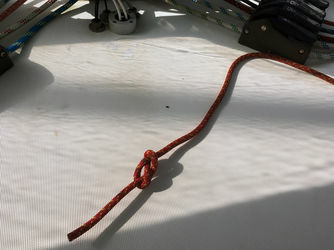 This knot can be used for everything: mooring the dinghy, fixing the fenders on the guardwires (it replaces the traditional clove hitch, the two half-hitches just follow on). Like the bowline, it is easy to undo. An old sailors’ adage: “a round turn and two half-hitches has never let go”. 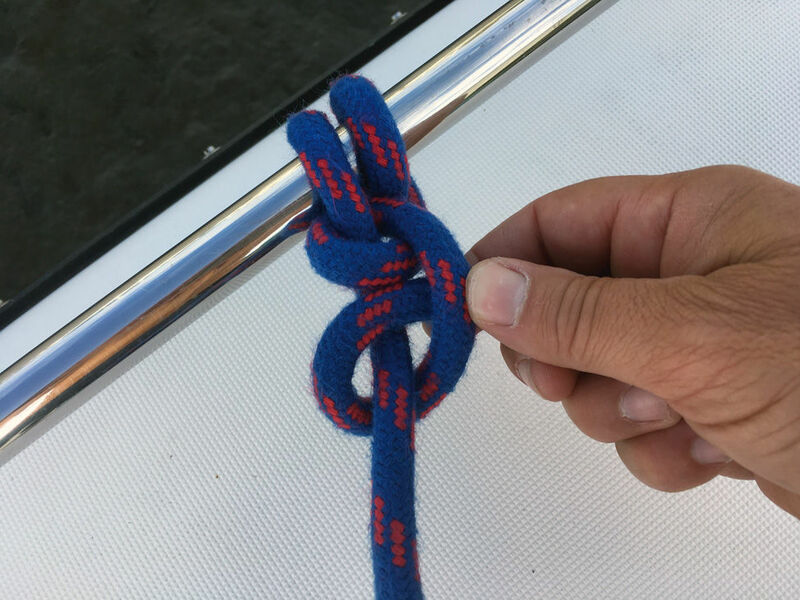 This knot serves only one purpose - it’s a stopper knot. All halyards and sheets - except for spi sheets when racing, or in extreme conditions - should have them. 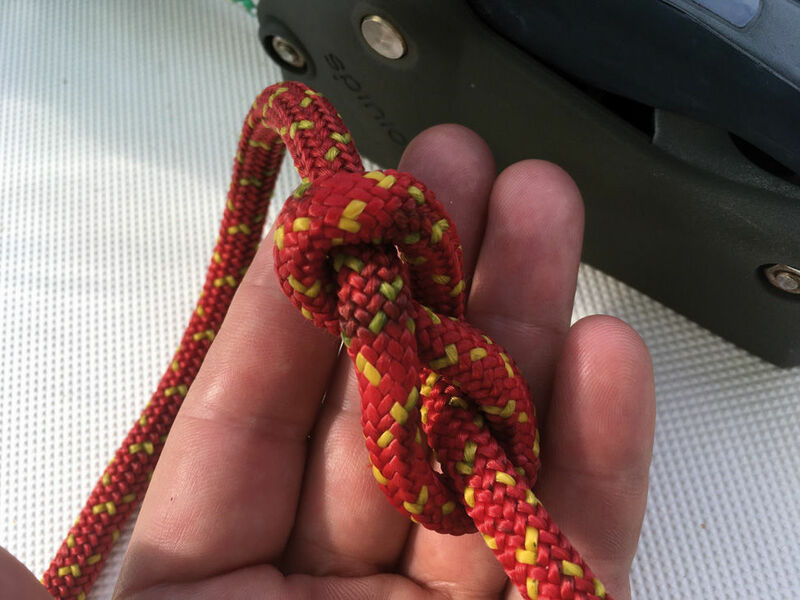 Avoid using the overhand knot, a simple loop which is difficult to undo once tightened. But what if you forget? A halyard might go to the top of the mast, or even worse, disappear into its sheave. 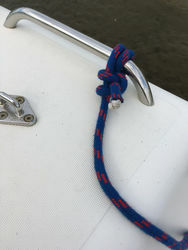 It’s no small matter, especially at sea, to re-reeve it... all the more reason to make sure that the ends of all your lines on board are finished by this simple little knot! 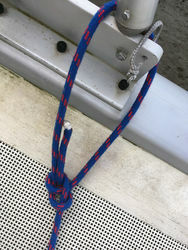 If the fairlead is too wide, add a turn around the standing part of the rope - this will give you a stevedore knot.